Britain's former world champion Tyson Fury will face German heavyweight Tom Schwarz in Las Vegas on 15 June. Fury, 29, will be fighting for the first time since signing a lucrative deal with US broadcaster ESPN worth a reported £80m for five fights. His promoter Frank Warren hopes Fury will face WBC heavyweight champion Deontay Wilder again after their draw. "I'm very fit, very ready; I can't wait to fight," Fury said. "Schwarz is unbeaten, young, fresh and ambitious." Schwarz, 24, is ranked number two in the world with the WBO and has 24 wins from 24 bouts, 18 coming via stoppage. "When you start as a little kid, you dream of cracking America," added Fury, who will box in Las Vegas for the first time. "I am going to go back and be on the biggest possible audience." Fury v Wilder in 2020? Fury's co-promoter Bob Arum said the fight would be "compelling" because Schwarz is "a big, big guy" at 6ft 5in. 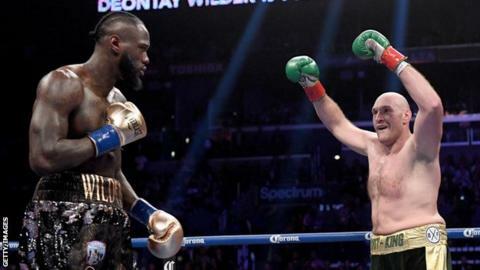 Fury's last contest in the USA in December drew plaudits for its drama, as he rose from the canvas in the 12th round to share a controversial draw with Wilder. A rematch had looked a certainty but negotiations stalled and Fury's move to sign a lucrative broadcast deal with ESPN all but ended hope of the contest taking place next. Fury, Wilder and unified heavyweight champion Anthony Joshua all now operate with different broadcasters in the USA, making fights theoretically tougher to make. Arum added: "Assuming Fury wins this fight, he'll have another appearance in the United States. Then hopefully next year in February he'll end up fighting Wilder." Asked if he understood the calls for a rematch with Wilder, Fury said: "Join the club. Me and Wilder have to have this rematch. "I have to take care of Schwarz, Wilder has to take care of Dominic Breazeale and then I say we get it on. He has gone quiet; I send him messages and he doesn't reply any more." Wilder faces Breazeale on 18 May, while Joshua takes on American Jarrell Miller in New York on 1 June.